This information is from “The Royal Blue Line” by William R. Gordon published in 1952. The trolley was an important part of Sodus Point commerce for not only the tourists it transported but also for the freight it carried. It carried mail to and from Rochester and locally it carried milk to Union Hill (near Webster) that came from the Proseus farm. The milk was picked up from the Prosens Stop (in Sodus Point) that was inaccurately name after the Proseus family when their name was not correctly read off of a document. The trolley pole for Prosens Stop still exists in Sodus Point. It is located on Lake Avenue across the street and 75 yards west of Art Ertel’s Garage. I have always wondered why some of these trolley poles were not taken down when the majority were removed. I had speculated that perhaps because they were hidden by trees they were missed. In a conversation with Bill Huff Jr., this pole was in front of his parents home. Apparently sometimes the people whose property the pole was on requested that the pole be left standing. Bill’s father used the metal bar that held the sign post to hang a deer from! The trolley used 60 lb. narrow gauge rails (the weight was from a 3 foot section) laid on gravel that came from the Glen Edith quarry near Rochester. 35 sidings were located approximately every mile for the expected traffic of one trolley every five minutes that was never realized. Business was such that a car ran every hour. 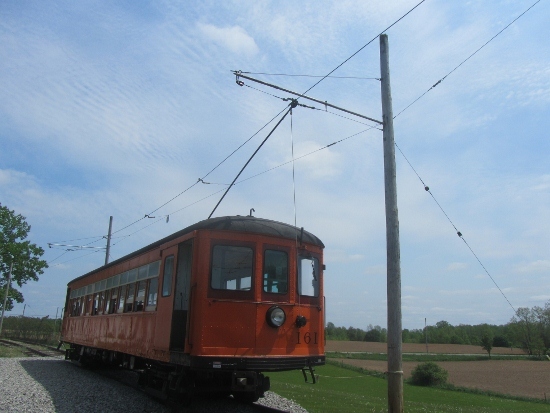 The trolley used 625 volts DC current and required battery stations to boost power along the lines. Two of these stations were located at Webster and Williamson with substations at Ontario and Sodus. When first laid, the terminus ended near Willow Park in Sodus Point. It was soon discovered that low voltage did not allow the trolley to carry passengers up the steep hill there and after several months the track was removed so it ended across the street from the Johnson House. This building was where Zoots” used to be next to the Post Office . One of the little known facts about trolley companies (throughout the U.S. in general and Rochester in particular) was that they purchased land at favorable locations for the purpose of establishing amusement parks which in turn would mean a tremendous growth in trolley business. Another interesting fact was that trolleys always tried to avoid sheep. If hit, the sheep’s greasy body would send the cars off the track. Several bad accidents were caused by stray sheep. Another thing that slowed down the trolley was snow. In those days, roads were not plowed and the trolley tracks were. As a result, farmers often drove their sleighs along the trolley tracks. During the winter months, trolleys often had to follow these sleighs until they could pass them at a siding. If the weather was good and sheep kept off the tracks, the trip from Rochester to Sodus Point took about 1 hour and 40 minutes. The following pictures were taken at the New York Museum of Transportation on 6393 East River Road in West Henrietta , NY. You can actually take a short trolley ride on one of the few remaining functioning trolleys from the 1920s. The trolley pictured below had a long career of carrying commuters in the Philadelphia area. It is the only operating electric trolley ride in New York State. How many people did it take to run the trolley? Theoretically, there were two people. The Motorman controlled the speed and braking of the trolley and performing any mechanical items that might be needed. There are no steering mechanisms on the trolley because the trolley simply followed the rails because of the flanged wheels. The Conductor was in charge of punching tickets of passengers and would announce trolley stops. Due to the fact that the trolley traffic never achieved the desired levels, normally the trolleys to Sodus Point only ran with a Motorman who performed both men’s function. The picture above shows a trolley Motorman and conductor. 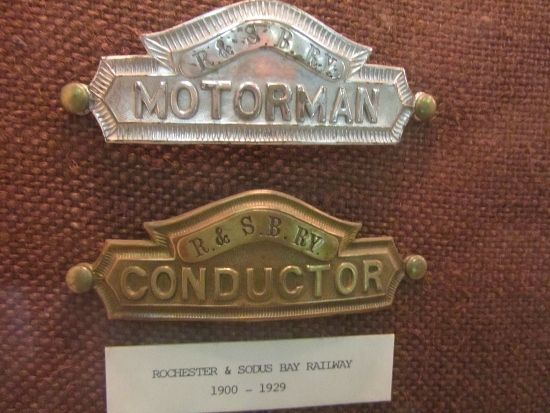 The picture above shows actual Motorman and Conductor badges worn on the hats on the Rochester & Sodus Bay Railray. 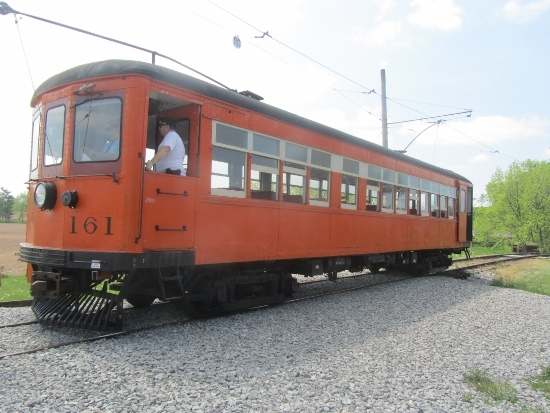 How did the trolley turn around when it reached the end of the railway in Sodus Point? The short answer is that it didn’t. The trolley had operating controls at both ends. When it reached the railway station located next to what is now the post office in Sodus Point, the Motorman simply went to the other end of the trolley. The trolley had two trolley poles at the top of the trolley only one of which at a time rested on the electric wire that gave the trolley its DC power. He had a rope with a pulley for each pole that he pulled and it would raise or lower the pole. The trolley also had a headlight on both ends of the trolley. A very clever design was incorporated in the seats. The top of the seat could be pulled forward which would reverse the direction the seat faced. 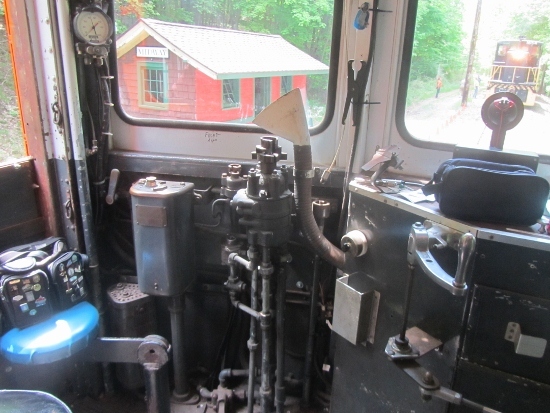 The picture above shows the trolley controls which were located at both ends of the trolley. Note the funnel looking device in the center is the defroster for the windshield. I was told it did not work very well. 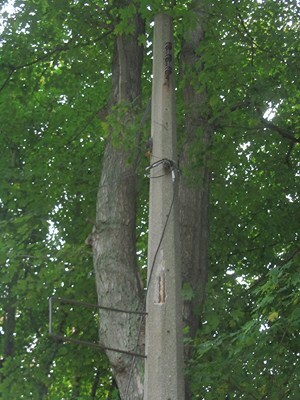 The picture above shows the trolley pole resting on the electric wire that ran above the entire railway from Rochester to Sodus Point. The motorman had a rope with a pulley that could raise or lower the two poles on the top of the trolley depending on which direction the trolley was going. 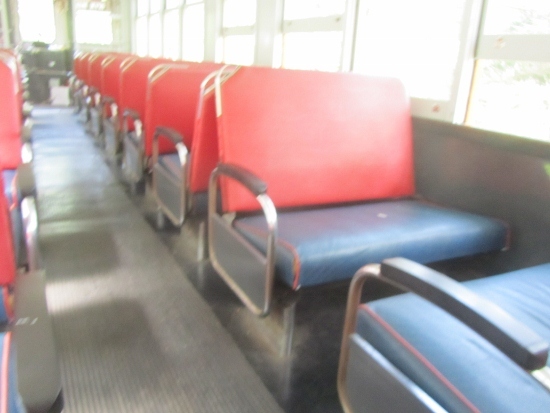 The picture above shows the trolley seats. By pulling the top of the seat forward, it reversed the direction the seat faced. 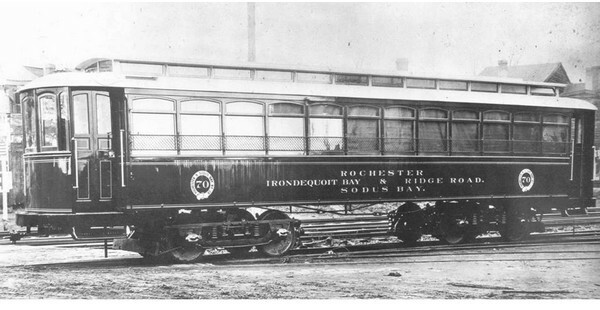 Henry (Hank or Yank) Gloor, the Sodus Bay line’s most popular motorman, ran the first regular car to Sodus Point, and on June 27, 1929 had the distinction of piloting the last car to leave the point for Rochester. I will end with a humorous story from September 7th, 1900…..